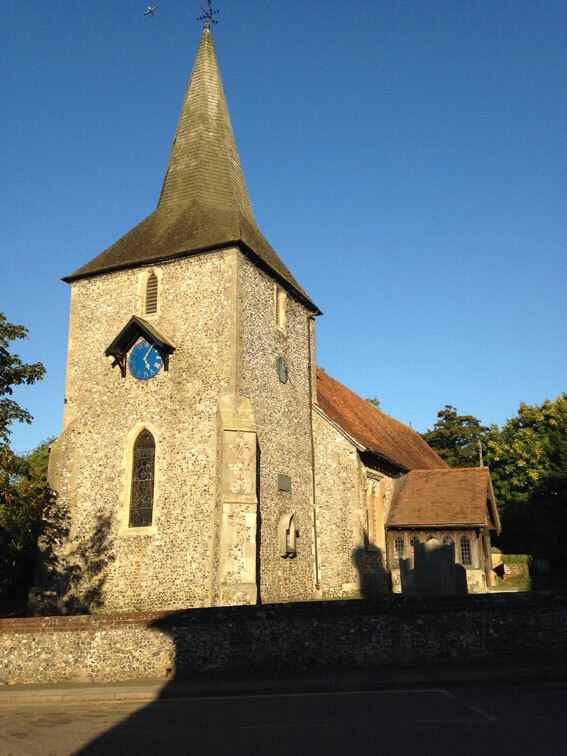 Darwin’s garden and house, wild flower meadows, hedgerows, the chance of seeing Second World War Spitfires, beech trees and old, flint and wooden houses and a beautiful church. Nice cake/tea shop and two pubs with decent food. An easy walk, no steep inclines. Great to combine with a visit to Down House, where Darwin wrote On the Origin of the Species. His study is kept in the condition in which he worked in it. Forty minutes’ drive from East Dulwich. Covered on Ordnance Survey Explorer 147 map. Strongly recommend download map and pdf as below… there’s little connectivity in this area. Easy to extend the walk by following the blue route on the map. Point 1-2 (about 500m): Take the path right just east of Christmas Tree farm on Cudham Rd, passing over a stile (don’t inadvertantly take the second path signed to Cudham). Walk past Christmas Tree farm paddocks then head diagonally across meadow to right. 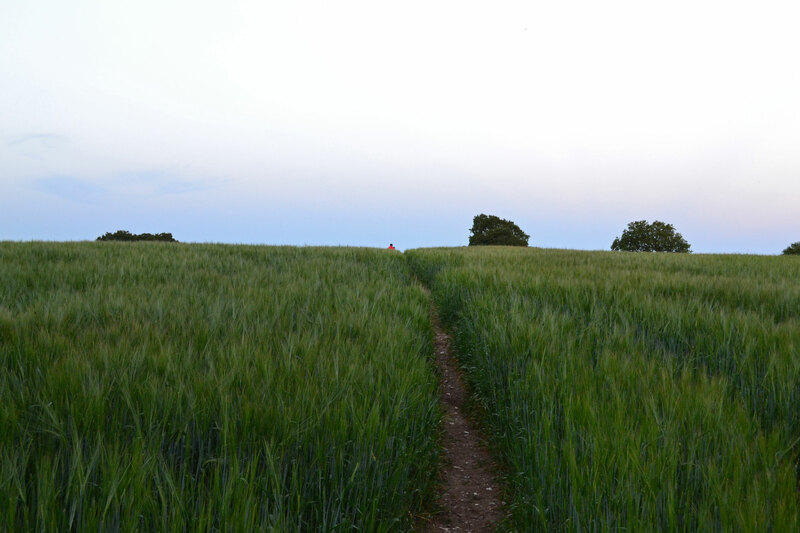 Ignore paths signed to Downe House then head diagonally left across another field towards a farmhouse. Point 2-3 (480m): Head towards farmhouse (south east) ignoring another path signed towards Downe House. Walk past sign for Stable Cottage and see ‘footpath’ sign in front of house pointing right (south). Join this path crossing over surfaced driveway and passing monkey puzzle tree and follow edge of field left then right. Arrive at path junction. 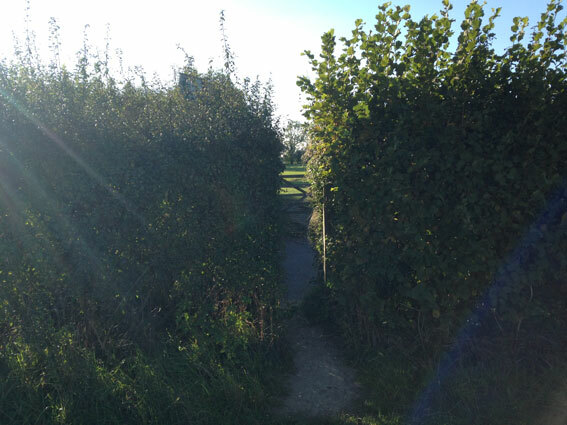 Point 3-4 (450m): Turn right on this path (west) heading towards country lane through gap in the hedgerow. At Point 3.5 on my map cross road and enter lovely meadow adjacent to Downe House. Pass through ‘gate’ of small trees in meadow and reach north western corner of field where there’s an entrance into the garden of Downe House. Point 4-5 (180m): Pass the entrance to Darwin’s garden, crossing the great man’s ‘sandwalk’ and walk through another lovely meadow on the path diagonally left. Watch out for deer at dusk and owls. The path increasing heads downhill then reaches a hedgerow and junction with a north-south path and signpost. Point 5-6 (280m): At this junction turn right (north) and follow the path through light woods to a country lane. Point 6-7 (850m): Cross the lane and continue on the path heading north. Soon it turns sharply left (west) before continuing north and emerging in a field with golf club in valley to left. Continue through two fields admiring beech trees and hawthorn borders. Point 7-8 (350m): Cross the final field (the third and largest) and enter woods ahead. Watch for a right turn ahead where you will enter another field to return to the village. There are two paths that enter the woods, it doesn’t matter which you use but if you choose the lower one then you will have to turn right, doubling back on yourself before just before emerging from the woods; if on the upper one, turn right and enter the field on your right. Point 8-9 (650m): Head east across field muddy in winter, sometimes cereal in summer, sometimes fallow. Aim for far right corner (south eastern corner) where the path narrows to a kind of alley with holly around and emerges on to the road into Downe by a bus stop. At road, turn right to go to the Queen’s Head or tea shop. Get off the bus by the church of St Mary the Virgin (13th century; look out for the graves of Darwin’s family) and walk east past the George and Dragon pub on Cudham Rd. 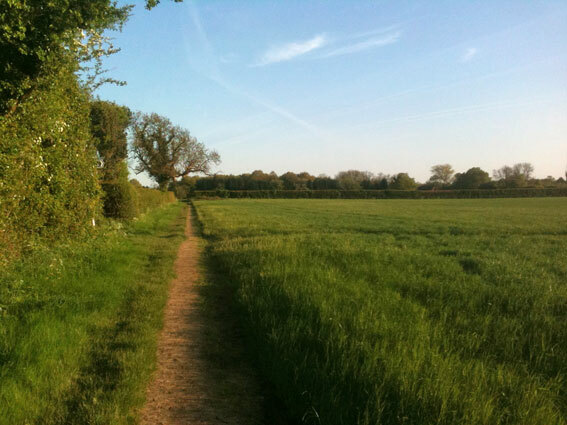 The walk starts with the marked footpath heading south off Cudham Rd just past the cute Christmas Tree Farm. 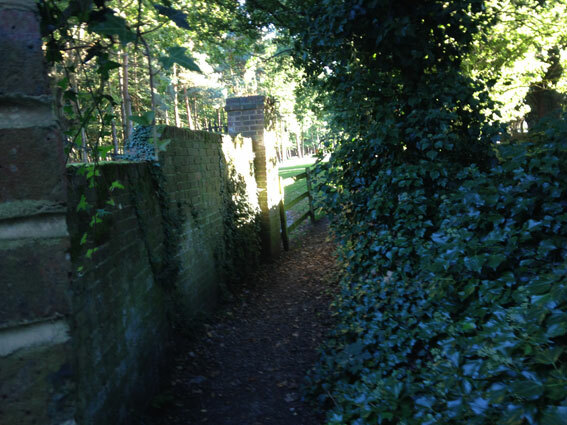 This footpath is signposted to Biggin Hill and Luxted, and is by a brick wall – do not take the footpath signposted to Cudham a bit further on (another fine walk but not now!) (Point 1). Follow the path, with the enclosures of the farm on your right. There is a driveway on your left (ignore it). Stop and admire the donkeys if you will, then, just after the final enclosure, follow the path to the right, diagonally across a field of grasses to a clump of trees where you’ll see Downe House a few hundred metres in front of you. The path now takes you diagonally left towards a farmhouse (Point 2) – ignore the marked footpath off to the right towards Downe House. At the farmhouse, ignore another footpath sign pointing back towards Downe House and continue past the Stable Cottage sign towards the house, skirting it and taking the path that heads south (right) just in front of it (another slightly hidden ‘footpath’ sign guides you) and go past a monkey puzzle tree while walking over a surfaced drive. Continue around the edge of a field to the left (east) then sharp right (south). At Point 3 take another sharp right (heading west towards Downe House) at the intersection of footpaths (if you were to go left here, you’d soon enter a fantastic bluebell wood, best seen in May of course). Cross the road (Point 3.5) and enter the meadow (brilliant with daisies and buttercups from May to July) bordering Darwin’s house and garden, with small cricket pitch on your left. Continue, through a lovely little arch of small trees in the middle of the field. 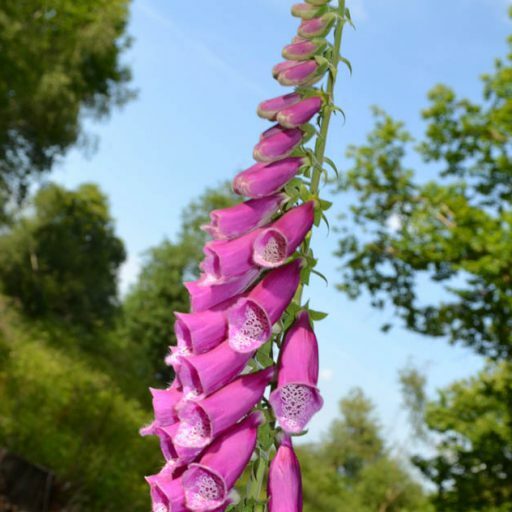 The path meets the western corner of Darwin’s garden (Point 4) – you can have a quick peek, but you’ll have to pay if you linger – then head across the great man’s ‘sandwalk’ and diagonally left across another field with a great view of a wooded valley. This is my favourite part of the walk as you look over unbroken treetops to the western horizon for what seems like miles. At dusk, watch out for wild deer at this point. Superb sunset vistas also. Don’t let the occasional waft of kerosene jet fuel from the airfield detract from the timeless vibe of this part of the walk! The path descends slightly into the valley then joins another path (Point 5), this time running north to south. So, turn right here (heading north) and just keep on going through the woods. Biggin Hill airfield is just beyond the trees on the other side of the valley. There is a quiet golf course on the floor of the valley (West Kent Golf Club). After a few minutes you will cross a lane (Point 6) and continue on the footpath heading north. The path suddenly turns left (west) just as it reaches a field beyond the fence and descends sharply for a few metres before bending back right and continuing for a couple of hundred metres through more mature woods to the first of the wildlife-rich hillside fields. So, now we’ve reached the first of the three hillside fields. You’ll see superb beech trees on your right (amid the occasional old bomb crater from one of many Luftwaffe attacks on the air base in August-September 1940) and the large golf club house across the valley to the left. Look out for deer, especially at dusk. You’ll cross the three fields (the last field, pictured above, is Point 7) on this path before entering woodland and, after about 80 metres, turning 90-degrees right to enter a field (there used to be a stile here but it disappeared in 2017!) (Point 8) and head east across this wheat/corn field aiming for the south-east corner (right-hand corner) until the path becomes narrow with a hedge on the right and you emerge back on to the village road. Until late March 2015 this field was a beautiful wild pasture with flowers and hawthorn trees. The tenant farmers have planted a cereal crop in there – lovely in June but muddy and annoying in winter. Also they have a nasty habit of ploughing it up and obliterating the footpath from time to time. On reaching the road (by a bus stop) turn right and look out for the Queen’s Head (Point 9) just before returning to the church and the village bus stop (Point 10). The extensive woodland on the east side of the airfield, which this walk skirts, is that mentioned by the late Geoffrey Wellum in his astonishing book First Light, covering his time at RAF Biggin Hill as a 19-year-old Spitfire pilot. I cannot recommend this First Light enough… it’s not a tale of derring-do heroics but a very true record of an uncertain young man thrust into extraordinary circumstances. During the Battle of Britain the airfield was badly damaged by bombing after a burst of intense low and high level raids at the end of August 1940 – not as many lives were lost here as at Detling near Maidstone but there were over 40 military and civilian casualties. The airfield, whose history began with radio experiments before the First World War, played a key role in the Battle of Britain and until 1944 while home to an incredibly international wing of squadrons including legendary French pilots such as Rene Mouchotte and Pierre Closterman, New Zealander Al Deere and South African Sailor Malan. The stories surrounding this place are the stuff of legend and yet there is little to be seen that tells the stories of heroism and disaster concentrated in these few acres. The Aircraft Museum in Shoreham might be a good place to visit to get a feel for what happened here. After the war, squadrons of Gloster Meteor jet fighters and Hawker Hunters were based there until it was decided (in the mid 1950s) that the area was too built up and not suitable for fast jets – a decision made after a couple of fatal crashes in the vicinity. Today the airport is used by flying clubs and executive jets. In recent years a few Spitfires, a Hurricane or two and assorted vintage aircraft have been based there and are often flown. One of the Spitfires, a second world war veteran that shot down a Luftwaffe fighter, was converted into a two-seater after the war and now takes passengers up – it’s about £2,750. The airfield has been a famous airshow venue ever since the 1920s – it is the site of the Red Arrows’ first display in the 1960s, and the first base for the Battle of Britain Memorial Flight (1950s). This tradition continues with often yearly airshows featuring the Red Arrows and extremely noisy jet fighters. You might find this thrilling; you might not. There’s a great little cake and tea shop, much used by weekend cyclists, on the left by the Rajdoot curry house just before the Queens Head. The Queen’s Head and the George and Dragon made the news on March 22, 2015 – ancient history now of course – when jolly protestors dressed as breastfeeding babies ambushed the UKIP leader Nigel Farage and rather spoiled his family’s Sunday lunch. What would Darwin have made of it all? Click the links for differing views of the protest, firstly from a Guardian journalist who travelled with the protestors and then the riposte from the Queen’s Head landlord. The Queen’s Head serves delicious ales from Westerham Brewery incidentally. 146 bus from Bromley (20 mins’ duration), or train to Orpington and then R8 bus (15 mins, no Sunday service). You can also get the train to Hayes (on the New Cross/Lewisham/Ladywell/Catford Bridge/Lower Sydenham line) and pick up the 146, or get a cab, or cycle. Hayes is the nearest railway station to Downe.